SCARE tactics and propaganda are being deployed by the British state in the run-up to the G8 summit in June. There is talk of special cells being readied for protesters at an army camp, of police-state style security measures and of overworked and stressed-out cops. The pressure has also been increased by the discovery of a mortar bomb which a dissident republican group says was intended for the G8 summit venue. 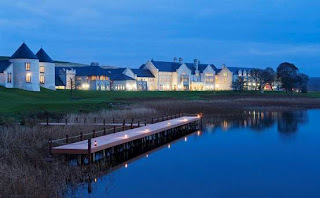 The authorities are facing big protests in three locations - in London for a week of action including the J11 Carnival Against Capitalism, in Dublin just before the summit and around the actual venue at Lough Erne, County Fermanagh (pictured above). "The police and prison services in Northern Ireland have begun arranging for hundreds of extra holding cells in anticipation of protests at this summer's G8 summit turning ugly," reports The Belfast Telegraph. Work is apparently under way to make available extra cell capacity inside Maghaberry high security prison in Co Antrim, as well as at Magilligan prison in Co Londonderry and Hydebank Wood young offenders' centre and women's prison in Belfast. The authorities claim a "ring of steel" will be in place around the summit venue at the Lough Erne resort. With the lakes of Fermanagh providing an additional natural barrier between the hotel and outside world, they say it is unlikely that protesters will get anywhere near the complex. The demonstrators' focus may therefore shift to the town of Enniskillen, five miles away, or further afield in Northern Ireland, says the Belfast Telegraph. 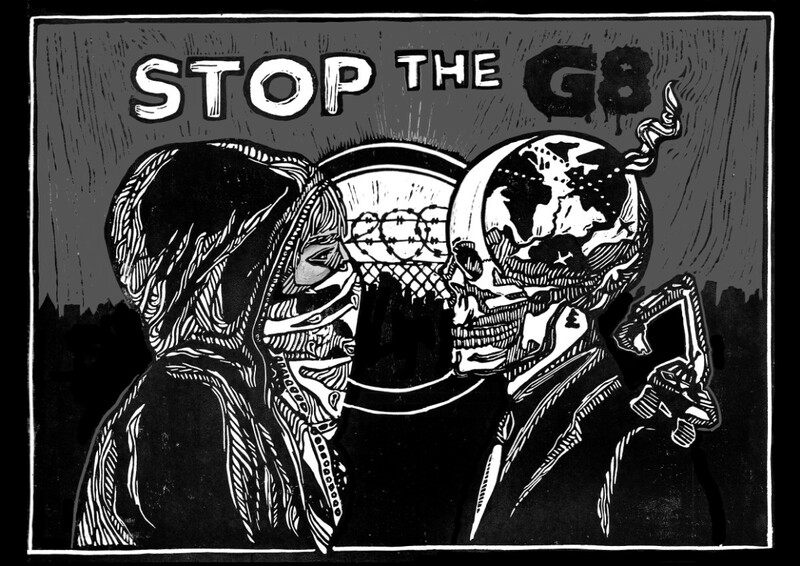 It adds: "Indeed London may witness the largest protests" - referring to the actions lined up by anti-capitalists Stop G8 on and around Tuesday June 11. Police in Northern Ireland told the BBC: "People travelling on 16, 17 and 18 June 2013 will be advised to leave extra time for their journey. 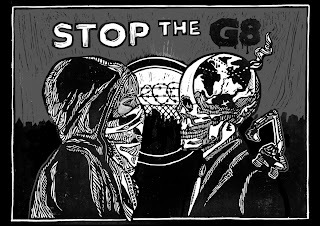 "Previous G8 conferences have also attracted a number of protest groups. Police will be planning for this eventuality and this may again result in some disruption to the transport network. "As a result there will be a highly visible police presence across parts of the Antrim Borough throughout the duration of the G8 conference." The police said that there would be a large security presence on all routes around the airport. There will also be a "larger than normal police and security presence" within Belfast International Airport itself in the days leading up to the arrival of the delegates. The Impartial Reporter focuses on the pressure on police for what it is being billed as a bigger challenge than the "troubles". It says: "With just 11 weeks to go until eight world leaders including US President Barack Obama visit Enniskillen, police officers on G8 duties in Fermanagh are complaining of being "over-worked" as they patrol the county around the clock. "In what will likely be the biggest security operation in the history of Northern Ireland, a considerable number of police officers here have been tasked with ensuring nothing goes wrong in the run-up to the global event. But some of the officers, according to the chairman of the Police Federation of Northern Ireland, feel under pressure by the workload." The bomb found abandoned in Fermanagh was claimed by republican group Oglaigh Na hEireann, which said it was to be detonated at the hotel hosting the G8 summit. In a coded statement to The Guardian, the anti-ceasefire dissident organisation also admitted responsibility for an attempted mortar bomb attack on the heavily fortified New Barnsley police station in west Belfast two weeks ago. ONH also provided two photographs of a mortar launching device alongside a printed note stating: "MK1 10KG Mortar, Range 300 Metres." The group's statement said: "Car bomb defused in County Fermanagh on Sat 23rd March. Target was hotel hosting G8 summit in June."